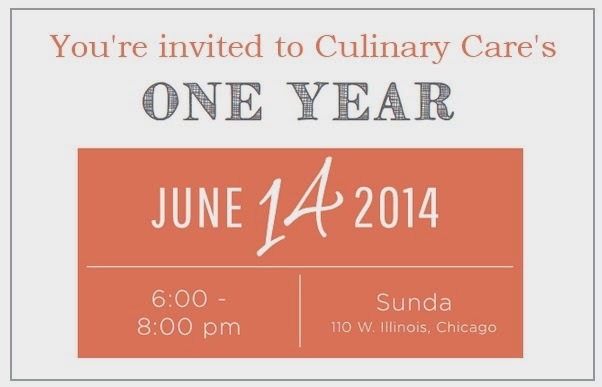 In our first year, Culinary Care's programs have provided 1,000 meals to families & individuals facing cancer. 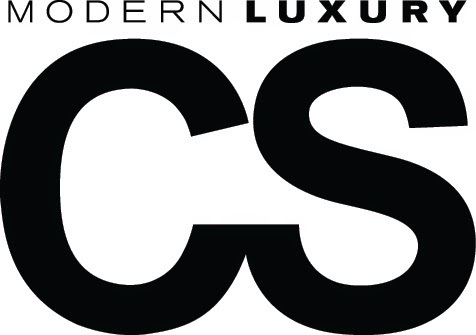 This has all been made possible with the support of our generous restaurant partners -- Hub 51, Paris Club, Maggiano's, Rockit Bar & Grill, Sunda, Goddess & Grocer, Rosebud, Carmine's, Bub City, Sullivan's, Zapatista, Mon Ami Gabi, RJ Grunts, Mity Nice and many more -- and our dedicated volunteers and referral partners. Nothing is more important than the families and individuals we've served, so we hope you'll be able to join us in this evening of philanthropy, inspiration, and of course, delicious food. Your support means more families & individuals will have the opportunity to relax and enjoy a delicious meal. We hope to see you there! 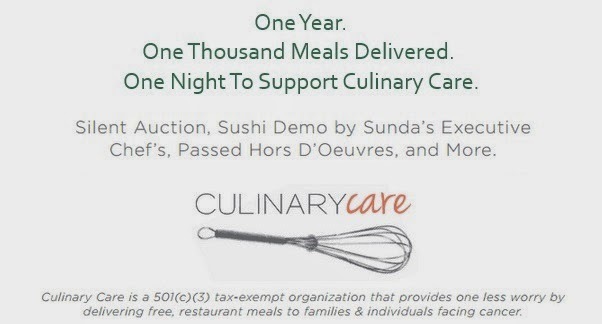 All money raised throughout the evening will go directly to supporting the growth of Culinary Care's programs. Culinary Care is a non-profit organization founded by my friend, Courtney White, as it is dedicated to delivering free and balanced meals to caregivers and fighters managing the stress of cancer. 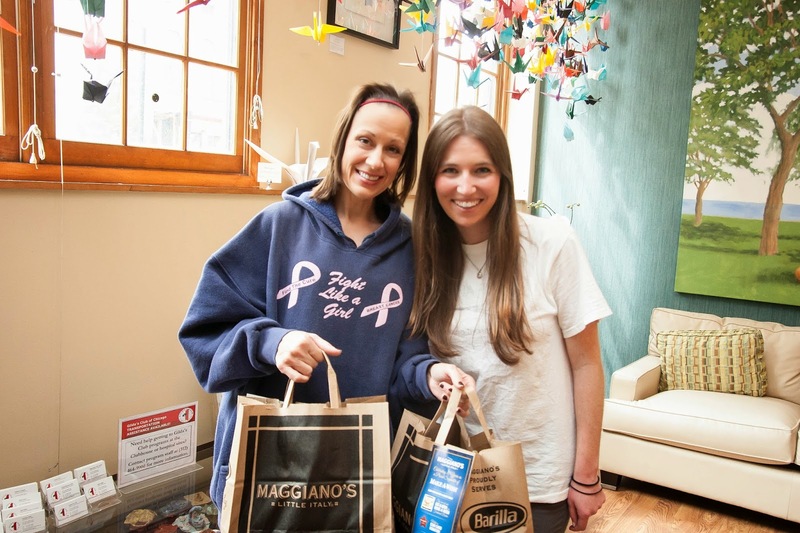 Culinary Care provides one less worry, we partner with local restaurants to take away the added stress of cooking a meal, and give those affected by cancer time to nourish and heal. We firmly believe that receiving support from the community can help renew optimism, strengthen hope, and encourage the endurance to continue forward. The average American spends at least 4.5 hours engaged and eating and drinking activities. Food has not only become a way to sustain our strength, but something we center our lives around. For many, it gives us something to look forward to each day, and that should be no different for those facing cancer. But, with changing taste buds, fatigue and a rigorous schedule, food often becomes an after, or in many cases, a non-existent thought during a time it’s needed most. For those that have a community, a freshly prepared meal is at our door-step without even thinking about it. For the rest of us, there’s Culinary Care. Culinary Care understands a meal is so much more than nourishment. It’s a helping hand, a return to normalcy, an opportunity to connect with family & friends, and one less worry. By partnering with local restaurants to provide complimentary meals for cancer patients and their families, Culinary Care creates an enthusiasm around food that gets even the pickiest of eaters licking their fingers. And, in their first year, they were able to provide 1,000 meals. https://culinarycare.eventbrite.com if you can't attend, please donate here.